I’ve been dragging my knitting around with me everywhere lately with the naive assumption that I might actually get the chance to squeeze in a few rows. I’m feeling a bit panicky to get this latest project finished–a sweater for Elizabeth. You see, the poor child is definitely lacking in the clothes department. Her sisters hand-me-downs, I’ve discovered fall just a season short of where she is at the moment. And it doesn’t help that Elizabeth grows an extra leg roll and back of the neck roll each week. Seriously, I think I might start counting her age in rings (or rolls), just like a tree. So, I’m in a bit of a hurry to get this sweater off my needles and on to her little freezing-purple arms and I’m crossing my fingers that it will fit. I told Dan last night while we laid in bed, him reading, me still knitting, that I felt a bit like Ma Ingalls. That I was making the sweater for winter that was desperately needed before the cold really set in. The pattern is from this book and I’d show you a picture, but a photocopy is all I have. It’s just a basic raglan sweater with three off-set buttons coming down the neck to her shoulder–a helpful addition for easy on and off with babies. It also helps that my sewing machine is broken, so knitting is my only option these days. Perhaps, my sewing machine is conveniently broken. On a completely different topic. I still get those babycenter emails–the ones that tell you what development stage your baby is/should be. And although I rarely have the time to sit down and read them, these last two caught my attention. This is a very good article about how to take good pictures of your children. It is written by several mothers who are professional photographers and has a lot of important pointers for beginners. And I got an email this morning about this photography project–"My America at Home". It’s a project similar to the "Day In The Life of America" books. But this one, anyone can get involved in. It looks good. Alright, a fight is breaking out in my living room over who gets to hold the baby. sometimes the deadline of an event or season is what i need to actually get me going on a project too. i bet the sweater will be wonderful – that neutral yarn looks really nice. knit on ma! knitting is the only thing keeping me sane these days! 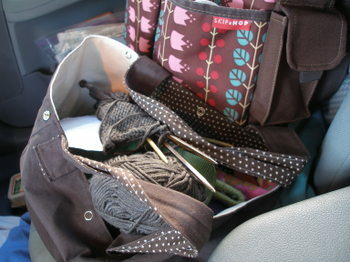 i cannot tell you how good it does my heart to see your knitting bag. is it holding up okay? 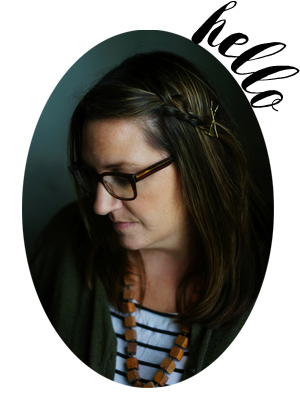 Crafting panic and craft-guilt, yes, I think there is plenty of that going around. But you;ll be surprised at the knitting opportunities that present themselves. This is why I rarely make kids clothes. I am slow and I can’t predict growth very well. I hope it fits! Was enjoying reading your blog today (just because I love it!) and I happened upon your nice mention of the BabyCenter article on photography. You can’t imagine how tickled I am — I wrote that article! And by the way, your photography on the site is just wonderful. One of my “baby” brothers is turning 50 this year (John, I doubt you are reading this, but that’s a FIFTY!!) I can remember so clearly runnung from the bus stop to the house trying to beat out my older brother by saying “I get Him first”!!! Every afternoon he would be poised (or propped) on the living room sofa just waiting…for the sound of us running. And then he would start to laugh. That’s LOVE. And that’s just what you got goin’ on there, fighting over the baby, enjoy! LOVE IT! I have one of those beasts too. But somehow my hand-me downs cover all seasons in all sizes. So the cloths may be stained, but the baby is warm… If she keeps the d*mned things on (and dry).